As Little Caesars Arena prepares to open in the fall, Ford Field is getting a $100-million renovation. As Little Caesars Arena takes shape along Woodward Avenue, the Detroit Lions are determined to ensure that Ford Field doesn’t get left in its vast shadow. The Detroit Red Wings played their final game at Joe Louis Arena on April 9, and, along with the Detroit Pistons, who are moving from the Palace of Auburn Hills, the two teams will take up residence at Little Caesars Arena starting in October. The move will put all four of Detroit’s major sports teams within a few blocks of one another, making it the most concentrated sports and entertainment district in the country. Although the new $650-million venue that was the brainchild of Mike and Marian Ilitch has been getting most of the press, it’s worth noting that Ford Field, home to the Detroit Lions since 2002, is simultaneously undergoing a significant makeover. If all goes according to plan, shortly before the world premiere of Little Caesars Arena — Kid Rock will kick off the first of six shows on Sept. 12 — Ford Field will be putting the finishing touches on a $100-million renovation. The retooling project, which includes larger video boards, updates to the sound and Wi-Fi systems, renovated suites, and numerous other features throughout the venue, was ambitious in scope due a demanding timeframe that called for completing the work between football seasons. Wood says he expects the project to be finished the first week of August, given the first preseason game at Ford Field is scheduled for the middle of the month. “I’ve got confidence the timeline can be met,” he says. Most of the demolition work was completed in March, while the renovation of older suites and seating started at the beginning of April. The largest addition to Ford Field’s updated look will be the new video scoreboards. The franchise invested in two Daktronics main video board displays that are each 39.5 feet high by 152 feet wide. The screens will be flanked by four additional displays, each measuring 13 feet high by 59 feet wide. The smaller screens can be used individually to show stats, scores from around the league, videos, and other content, or they can be coordinated with the main display to make one, continuous 270-foot-long video screen. To put that into perspective, each combined screen is the equivalent of 556 60-inch TVs. In addition to being able to show more action, the improved screens will give the Lions greater opportunities to serve their fans. This renewed focus on fan experiences is a smart move, says Sean Daly, a recognized expert on sports and event venues, and associate professor at Denver’s Johnson & Wales University, one of the few programs in the country that offers a sports, entertainment, and event management degree program. “More and more these days, companies like the Detroit Lions, the Red Wings, and the Pistons are battling, literally, with, ‘Do I go home to watch the game or do I go to the game?’ ” he says. The battle for attention goes hand-in-hand with Ford Field’s much-needed Wi-Fi upgrade. If there’s been one consistent criticism of the venue over the past few years, it’s that fans are unable to use their smart devices during games. Wood says the complaints didn’t fall on deaf ears, and after the renovation, Ford Field will feature some of the best Wi-Fi in the NFL. The Lions started laying out plans for the Wi-Fi upgrade last season, including an in-game test that Wood says most fans were oblivious to. The Wi-Fi upgrade — vastly improved bandwidth and speed was installed by Rocket Fiber in Detroit, while Verizon provided the new system — includes access to the entire stadium, the exterior of the stadium, and the parking garage. Although the new video boards and Wi-Fi are the main features that will appeal to pretty much every fan who enters Ford Field, the most labor-intensive aspect of the renovation is the complete overhaul of the suites and club level areas. That task went to Rossetti, an architectural firm in Detroit that was one of the original designers of Ford Field. Renne says at one time, suite-holders tended to be older fans and corporations that desired a certain level of isolation to host clients, families, and friends. 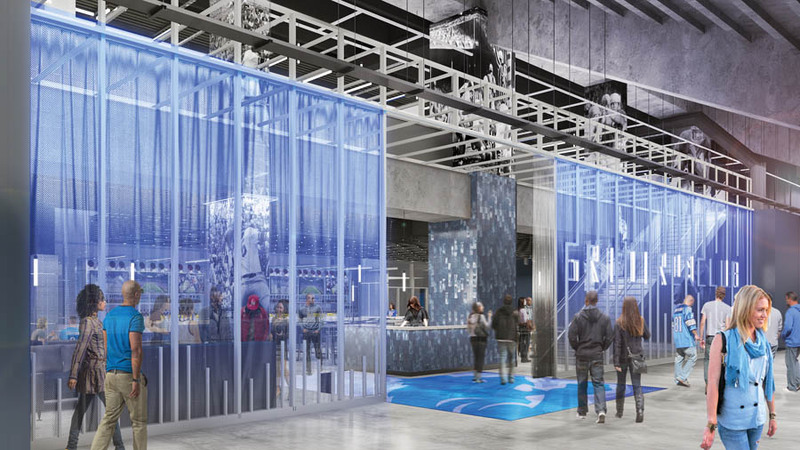 However, those trends are changing, and Rossetti’s suite designs for Ford Field will reflect that. In addition to an overhaul of the suites and club areas, Ford Field will see a redesign of The Corner Lounge, which will now be called Corner Bar. While Ford Field undergoes a pricey renovation, and the Pistons and Red Wings are getting a new arena, what’s going on with the Detroit Tigers and Comerica Park? Over the winter, the baseball stadium completed a parking deck at the north end of the venue, while a new video board, one of the largest in baseball, was installed in 2012 and the Wi-Fi system was upgraded in 2015. The team also is unveiling an array of new food and drink offerings this season. With all the competition for sports and entertainment — downtown Detroit has the second largest collection of theater seats in the country — the renovation at Ford Field is the first step toward keeping the venue relevant in a landscape that offers fans so many options (maybe even one more option if pro sports owners Dan Gilbert and Tom Gores are able to convince Wayne County to let them build a soccer stadium at Gratiot Avenue and Beaubien Street, where a planned jail was left uncompleted due to cost overruns). While there’s little doubt that Lions fans will flock to Ford Field at the end of the summer to enjoy the upgrades, one other thing that would make the team a bigger draw is taking home the Lombardi Trophy from Super Bowl LII, to be held on Feb. 4, 2018, at U.S. Bank Stadium in Minneapolis. If that happens, Ford Field will most likely open its doors, turn on the giant screens, and allow fans to cheer the team to victory.